Undine by Chauncey Bradley Ives. 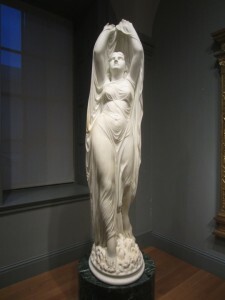 don’t you love the Smithsonian for free entertainment and culture? 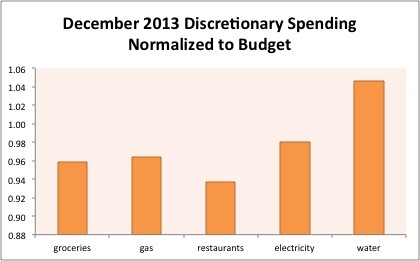 Given that this was December, we actually had a pretty normal spending month. We bought all of our Christmas presents, but the cost was reimbursed out of our Travel and Personal Gifts account, as was our spending on gas to get to my parents’ house for the holidays. 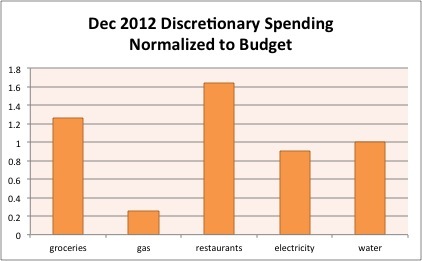 Our discretionary spending was remarkably close to 100% across all five categories. We had an unusual number of miscellaneous purchases this month, but they were all fairly small and absorbed by our budgeted money. We are gearing up for some major spending. As soon as we get back to Durham I am going to order the Moto X to upgrade my Republic Wireless phone – I’m so excited! We’re also narrowing down what kind of camera we want to buy and will likely purchase the body and a starter lens soon. Cell phones: Kyle’s usual $69.90; due to credits to my Republic Wireless account, we didn’t pay anything for my cell this month! Groceries: We really front-loaded our grocery spending this month and thankfully haven’t spent too much on groceries in the time we’ve been staying with my parents. We came in slightly under budget, so we’re transferring the excess $16.71 to our CSA account to buy sustainable meat. Gas: 2.5 fill-ups this month, aside from the gas we used for traveling. Restaurants: Three times this month, Kyle bought restaurant food when I did not. 🙂 We also went out to dinner once together with some friends. 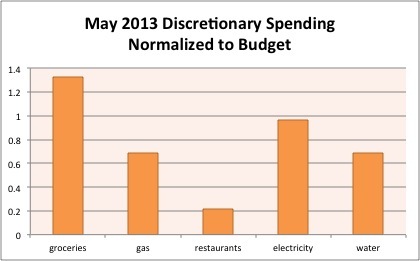 Electricity and Gas: Barely under this month! We have to watch out as we use our heat more and more into the winter. We received $100 in monetary gifts. $50 is in cash, which is sitting around until we find something to do with it, and the other $50 we spent on NYE tickets (combo with Entertainment budget from below). Kyle spent $18.24 on a notebook and a silicone baking mat. Kyle gave $40 toward the collection his department takes up for the housekeeping staff. I don’t really think of this as charitable giving since it’s more similar to a tip, so it’s coming out of our general budget. I bought stamps for $8.74. I paid $1.25 in late fees at the library. We printed a couple test photos for my mom for $0.42. We spent $768.31 out of these accounts and transferred $206.02 in above our normal savings rates. Our Christmas spending came out of this account, for a total of $485. We paid $127.80 for a car inspection, registrations fees, and property taxes. We spent $1.27 on a Redbox movie and $100 for NYE tickets. We put the discretionary portion of Kyle’s side paycheck into this account, $105.80, and a $50 gift (from above). Kyle gave $5 to people who approached him in the grocery store parking lot asking for money/food on two occasions this month. I love his giving heart! He’s teaching me a lot about having an open hand with our money. We also bought some soup from Panera ($5.36) for a man who asked us for it outside of Kohl’s. Kyle is pretty sure that he’s the same person who asked him for money outside the nearby grocery store. We moved our leftover grocery money into this account (from above). We put $50.22 into this account for taxes on Kyle’s side paycheck. No budget changes needed right now. We had $15.48 in budget leftovers this month, which we transferred to our Nest Egg to repay ourselves for our move. How did you weather your December with the travel, gifts, parties, etc.? 7 Responses to "December 2013 Month in Review: Money"
Nice way to wrap up the year! Our December was a little pricey, but we both made more at work, so it was kindof worth the stress spending a bit. Better to work out that way than to stress spend and not be paid more! And who can complain about December, market-wise? God bless you guys for helping those in need. Seems like you had a pretty good month in a month that’s usually hard on the finances! Aw, thanks. We haven’t bought food or had a conversation with a homeless (?) person before so it was a pretty interesting experience. I love preparing for Christmas spending throughout the year! Great way to finish the year. My month finished pretty strong considering Christmas and travel, plus a vet visit. That’s good to hear. At least you could prepare for the first two and I hope the vet visit wasn’t too serious!